I know everyone is playing D&D just now (comments drop precipitously after 4 pm on Fridays, and don't pick up again until mid-Sunday), but let's try an experiment. There's no hurry. 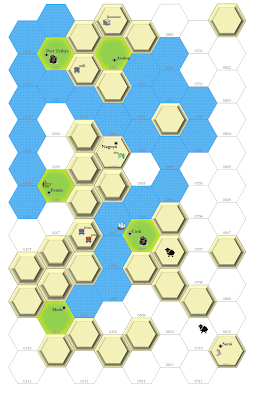 Here we have a simple hex map, with numbers. As a volunteer experiment, we're going to make a game region together ~ or rather, the readers will, I'm just going to be the guiding hand. The region will be a Development-7 region (as that's what I'm working on just now). Don't worry what that means for now, just suffice to say it's fairly backward. Up to three water hexes, until a total of 24 total hexes have been so designated. Up to three highland hexes, until a total of 30 hexes have been so designated. One settlement, up until 7 settlements have been named. One productive reference, until 15 total references have been named (get to this in a moment). You don't have to use your full compliment of hexes. Each physical feature you name should have a hex number indicating where it is (but not the reference). If you choose to put something in a hex and someone else got their first, your choice is suspended, though you can make another choice afterwards. You may clump all your hexes together, or you may scatter them around. You do not have to put your settlement hex in a highland hex you pick (assume hexes that are blank as lowland hexes). If you put a settlement in a water hex, it indicates an island or peninsula takes up part of the water hex. You can rush to take up hexes or you can wait to add what other people have started. It is up to you. Water hexes may end up being seas or lakes, depending on how they scatter. The point here is that we can build on the simplest of details, to expand the region into something interesting. You can only pick one; you might pick something that's a luxury or something that's food or industry oriented. It will make a difference on the culture, if everyone goes in a particular direction. More than one of a kind of reference may be picked, so if someone already picked, say, horses, you can still pick horses again. (So help me, if you all pick horses, I will make it work, but it will make the region somewhat heterogeneous). I'll try to check for your comments as often as I can, though I'll be sleeping or unreachable for periods tomorrow (hey, it's Christmas). I'll update the map, too, as data comes in, and update the image on the blog. If you notice that your reactions at the bottom of the post keep disappearing, it is because the zeros reset every time I open the post and update it. I remember that's why I abandoned the feature before. Continue reading on the sequel to this post, Cleaning Up the Invented Region. Hmm. This looks like it should be interesting. A Highland hex at 0301 and 0401. A settlement at 0202, named Port Tethys. A reference to Salt, at 0203. Settlement, hex 0402, naming it Avalon. Now to find out how much of their economy centers around horses. Sorry, Pandred. Are you saying you're picking horses as a reference? Archon, there are rules about the placement of references I haven't explained yet (said in the post not to place them), but it can sit in 0203 for the time being. Thanks for putting up with my grumpiness. 1. 0407, 0506, 0606 as water. Ah sorry. Do as you will with the salt. I'll take 0605, 0504, and 0404 as my water hexes. And a rice reference somewhere. Behold, the salt and all the references are just placeholders, for the moment. They'll get placed once we'd managed some calculations in the next phase. And I did find an icon for hosiery, if you were challenging me. Hosiery wasn't meant as an icon challenge but as an economic one as something so usually removed from adventuring mindset. I also meant to add it to build up the trade city of Port Tethys. It's small and portable good for trade on what's looking to be a river snaking though the landscape. Sarai was in the corner deliberately with the idea of it being poor outsider community in contrast to the connected parts of the map. However it's now in the hands of other readers and I'm excited to see how they pour in their own visions into it. I've actually been using a simplified form of your production system on small areas and am impressed how it builds societies. Big capital cities force the creation of lots of smaller settlements to feed their enormous need for resource quantity and variety. As always you have the most interesting ideas. It has been my intention to randomly place the references, according to how the infrastructure works out ... but of course for something like this, we can skip a random roll, as it isn't game play, it is design. I was thinking how rice dictates the climate somewhat; the stockings need a fiber source, either silk or wool I think. Or they could be made from a raw source imported from outside the region. It is up to what the readers pick going forward. Good morning, and Merry Christmas to you. I am intrigued by this exercise. Best of wishes to you. That's the last of the settlements. There are still water and highland hexes to pick, and production references as well. I'll update the map in a few hours. Ah! I'm glad someone remembered to add a market. And that's it for water hexes. I count room for 7 highland hexes left. And we're up to 8 references. Sorry, Vlad. Chris picked 0409 for a water hex. We can accommodate your other choices. You have one pick left if you want to change. I'll update the map later. Pretty busy just now. I can't be sure of those numbers. They do not match up to the map. Could you repost, please?